Ignition Woes - an endemic modern problem? Ignition Woes – an endemic modern problem? The last two years with our 1972 MGB roadster have been rather fraught with ignition problems, first one new component failing and then another within the distributor. The car was totally refurbished in 2005/6 in an attempt to build in reliability. The original 25D4 distributor was retained but with new leads, cap, rotor, points and condenser. During 2006 the ignition worked perfectly and our trip to Northern Spain & Portugal in 2007 was problem free. One day in 2008, seven hundred miles after a routine service, while motoring happily along in the sunshine (hood down of course) admiring the beautiful scenery around Blanchland the car started to occasionally hesitate and then a definite misfire was added. This grew worse so we decided to head for home but the misfiring and backfiring became gradually worse. Resetting the points a number of times helped - for a bit. Eventually it seemed we were down to 2 cylinders and no power and forward motion was a series of bunny-hops when all 4 cylinders worked in unison only then to revert to 2, or so it seemed, coupled with loud retorts from the exhaust pipe. Australian petrol delivered by kangaroos?? When it seemed that the car would go no further we called for professional assistance. The rescue mechanic had worked on MGBs in the past & confidently stated that it must be the points gap – which he reset. This fix lasted about 3 miles from Stocksfield to Wylam; after that we were trailered back to Newcastle. The points were severely pitted and new points, condenser and a new earth wire fixed the problem – but only for a while. Three months and 900 miles later a similar series of misfirings and backfirings accompanied us back along Hadrian’s Wall from Gilsland. This time we nearly made it home while praying to all the motoring gods not to have a complete breakdown. They were obviously ageing and were slightly deaf; they did not hear us. Almost within sight of home the engine suddenly died. Checking within the distributor, the 35 year old pigtail low tension lead was badly frayed with possibly one strand remaining – hah, the cause. Luckily it was possible to refashion a connection at the roadside and the car worked well enough to get us home. A new low tension lead was installed replacing the temporary roadside repair. However the misfiring returned almost immediately. Again, checking all electrical systems with a multimeter & a timing light with dwell facility failed to reveal the cause. The misfiring continued and worsened until eventually the engine would occasionally only give a desultory cough but would not run. Having the plugs and points gap set at 25 and 15 thou’, respectively, as set by a METRIC feeler gauge did not help – Doh! That was however, not the cause. A systematic item replacement was started and it was only when the condenser was replaced was the problem solved. The condenser that had failed was only about 3 months and 900 miles old, out of a green Lucas box and labelled “Made Under Licence By Lucas”. An electronic ignition system appeared attractive BUT, apparently, if/when they fail there is a complete failure and it is then necessary to re-install the old points and condenser to get you home. However I had heard that some electronic systems require a base plate alteration that makes a points re-instalment impossible. The electronic systems do away with the points and condenser but the rotor is still necessary. So, what to do? Sticking with the old system of cheap and easily replaceable points etc., a new 45D4 distributor was bought and installed with the original 25D4 (now with relatively new tried & tested innards, cap and leads) kept in the boot as a spare. The spare was all marked and set up to be an easy replacement at the roadside – well, easier than replacing points and condenser. All augured well for the future as we were now covered for any ignition related eventuality, also having a spare coil in the boot. Ha! Ten months and 4000 miles later, at MOT & service time, a rather peculiar problem was discovered. When the distributor cap was removed, the carbon brush within the 10 month old 45D4 distributor cap was missing! The car had been running perfectly. It was the broken retained brush spring that had been conducting the high tension voltage to the rotor arm top which was badly scorched – see picture. The interior of the distributor did not show any signs of pulverised carbon so where was the brush – on the floor or still within the body? 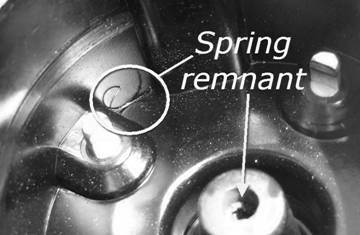 The remnants of a broken spring were found within the cap. 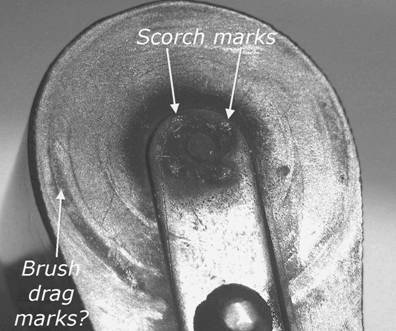 Interestingly the newer caps appear to have a considerably larger channel for the carbon brush & spring – the original pattern ones were a snugger fit – indicating a possible mechanism for the brush to have escaped. 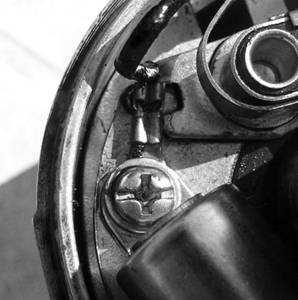 A new distributor cap, with spring & brush and a new standard rotor were fitted. All seemed well. Returning home, after passing the MOT test, the engine started to falter within 3 miles. Nothing too much, just the occasional missed beat. This continued while out testing on-the-road. Testing the high and low tension wiring indicated no fault but there were no running problems at the testing time on the drive, only on the move. Later, while demonstrating the on-going intermittent and occasional “fluffing” to the garage mechanic, the engine beat became seriously worse as we were heading back to the garage. Great - evidence of an intermittent problem demonstrated. Then the engine cut out and died completely on the Central Motorway in Newcastle - scary with no hard shoulder and at the end of a slipway. The engine was dead and would not fire with good cranking speed. We demonstrated that there was petrol being delivered to the float chambers. The distributor cap was removed; all looked fine but a replacement rotor was empirically substituted with instant firing and no more “fluffing”. The rotor that was causing the problem was less than 20 miles old and of the “good” pattern with the rivet outside the base circle and it showed no sign of any cracks, scorching or any reason for the failure. Two new “uprated” red rotors were then obtained – one for the active 45D4 and one for the reserve 25D4 as well as “uprated” condensers for both (unfortunately the two are not compatible so spares for each have to be carried). 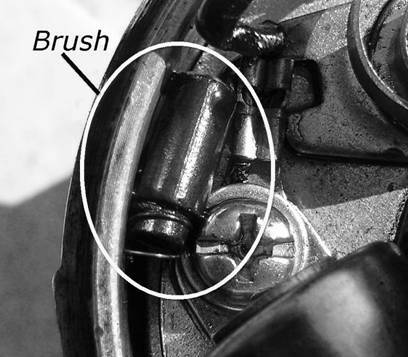 While checking the points gap with the distributor out, the missing carbon brush was found intact and lying loose on the 45D4 base plate – was this the cause of some of the problems? Was it now time to go electronic? It seemed madness to consider it after getting improved rotors and condensers but what cost being stranded? However having an electronic system one is still subject to the weaknesses of the brush & rotor manufacture plus larger cap brush channel with loose fit. A planned trip to the Dordogne area of France in June 2010 plus the past experiences prompted a change from the old allegiance to the original distributor technology, hastened by probably poor quality components being supplied nowadays. New information about a relatively inexpensive (but could it also be reliable?) electronic system spurred a foray into the electronic market. Additionally an old pattern distributor cap with the narrower brush channel has been sourced & installed. So far, some weeks and about 2200 miles later, after the Dordogne trip, all seems to be well; no ignition issues. We still have the spare complete 25D4+cap+leads in the boot along with a 45D4 spare base plate with correctly set points just as insurance. Can one ever be too insured? An old hand wisely stated “the spare that you need is the one you are not carrying”! Help. The boot is not very big. Have we just been very unlucky or is this the pattern of unreliability to be expected? This calls into question the wisdom of “routinely” replacing things like points and condensers at regular “service” intervals. It is possible that an old working item will be substituted by a defective, or soon to be defective, replacement. Maybe it would be better, given the present reliability issues of the new items to wait until the old working ones give up and then substitute. However, that will invariably be in the dark on a bad stretch of road while it is raining. You pays your money and takes your … but should it be like this? As a result I have learned a lot about the ignition systems of older cars but am in no way an expert on individual system failures. Most recently, since all of the above happened, the fuel pump failed to pump leaving the car stranded – many thanks to those who stopped to offer assistance. A sharp knock on the SU pump body (standard procedure) cured the immediate problem but is this a warning sign of more to come? Ho hum.